Talk about a life hack. Though some of us may have an entire section of our living quarters devoted to hair and makeup tools, a few beauty bloggers have found alternate hair and makeup uses for everyday items like plastic spoons, toothbrushes, and yes, even maxi pads. Surprisingly, the end result is pretty impressive, and almost challenges the effect we’d get using an arsenal of our own tools. Keep reading to see three of the most creative uses for household objects, probably in the history of ever. Rest assured that if you leave your BeautyBlender at home when sleeping over at bae’s, you can still rock that a chiseled contour by repurposing that spare toothbrush. In a 15-second Instagram video that has gone completely viral since it was posted, beauty blogger Miriam Marroquin uses a toothbrush to first swipe on a few creme bronzer stripes on either side of her face and down her nose, then uses the bristles to blend it out. If you’re so inclined to try out the method, she recommends using a children’s toothbrush or one that has soft bristles—preferably one that’s clean. “This is literally the strangest thing I’ve done to my hair for you guys,” says YouTube guru Tina (aka MakeupWearablesHairstyles) in the video above, probably putting it lightly. To create voluminous curls overnight without the use of heat, Tina took a pack of Stayfrees, rolled each one inward to create a long cylindrical shape, then wrapped large sections of her damp strands in alternating directions around the maxi pad roller. Because of the way maxi pads work, all of the water from her hair was absorbed after about four to five hours. Once her curls had set, Tina used a little hair oil to loosen the shape, resulting in some major Kim Kardashian volume. We love the dramatic effect created by the cut-crease shadow technique, but getting it as precise as possible can feel like a losing battle—especially if you have a hard enough time getting both sides of your winged liner to match. 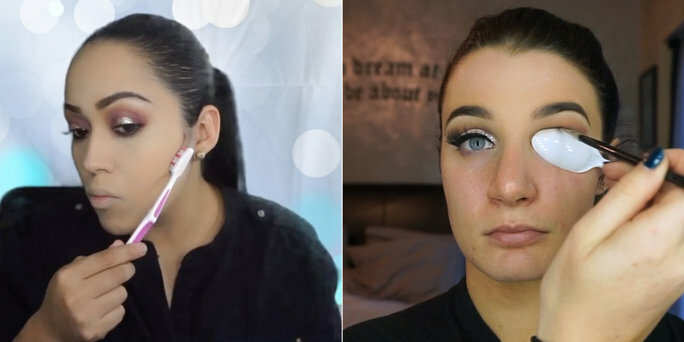 Beauty blogger Brittney Foley, who goes by Beautifoles on Instagram, found the ultimate trick to perfecting the method in the form of a plastic spoon. Because its shape mirrors that of the cut crease’s finished effect, it pretty much acts as a stencil. Simply line up the edge of the spoon with where you want your crease to appear, blend shadow over the area, then fill in your lids with your color of choice.